Do you wonder why you struggle with your relationships? Or with your thoughts and feelings? He’s waiting for you to ask him. He loves to guide his children to freedom. Click on the video and hear what happened when we asked. 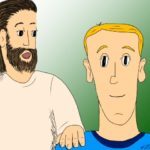 What did Jesus tell or show you when you asked? Just leave your testimony in the box below.